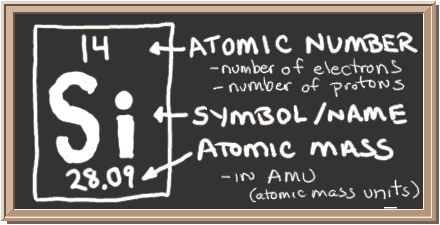 So... for the element of SILICON, you already know that the atomic number tells you the number of electrons. That means there are 14 electrons in a silicon atom. 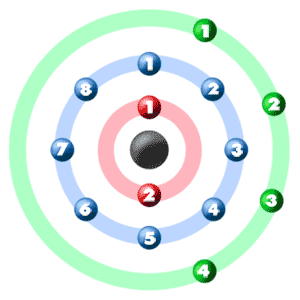 Looking at the picture, you can see there are two electrons in shell one, eight in shell two, and four in shell three. ► More about the history and places to find silicon. Silicon dioxide is very much like carbon dioxide (CO2) in the way the electrons are shared. 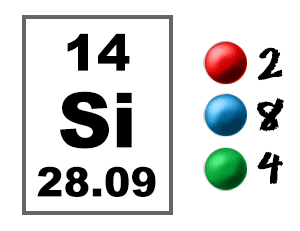 If you look at the periodic table, you'll see that silicon (Si) is directly below carbon (C). When elements are in the same column, they act in similar ways. So, silicon creates two double bonds with two separate oxygen (O) atoms. Look at the dot structure to see how the electrons are shared!